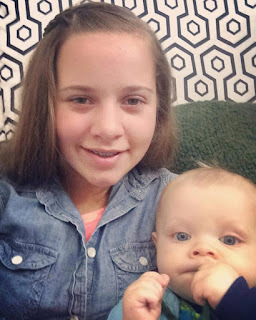 Duggar Family Blog: Duggar Updates | Duggar Pictures | Jim Bob and Michelle | Counting On | 19 Kids: ANOTHER Boy? Oh My! Now that Joseph and Kendra Duggar have announced the gender of their baby, we can officially say that the Mackynzie Duggar and Meredith Duggar are outnumbered. They have three brothers and four male cousins (now with one more on the way). Jinger and Jeremy Vuolo will welcome their first child in July and are looking forward to finding out the gender soon. Joy-Anna and Austin Forsyth are expecting a baby in the next few weeks but have chosen to be surprised. If Baby Vuolo and Baby Forsyth are both boys, Mackynzie and Meredith are really in trouble! Even if you include the rest of the Duggar clan, the ladies are still outnumbered. Out of the current 36 family members, 22 are guys, while just 14 are females. I had a boy in 1964 - another boy in 1966 and a third boy in 1969 . . . . back when we did not know the gender prior to birth. . . then in 1972 I had a girl. We ALL thought it would be another boy and were thrilled to have a daughter. I am a firm believer to wait and find out the gender at time of birth. Good for Joy & Austin. . . .guess that comes with the generation for the most part. I don't think there's anything wrong with either. Some people want to call their baby by the name they choose, instead of having to say "it" or "the baby". Anon 5:33. I also have 4 boys and a girl. But my girl is the oldest, so that makes a big difference. Lord willing, we will have another girl one day. I found out the gender of my son. Didn't do the whole big reveal thing. If i have another baby I want to find out at birth. I think that's awesome. The Duggars are a wonderful family and it is now a the point one has to keep track or just wonder! You are the only girl! Hang in there! I feel like she's having a girl. Idk why! I counted 15 girls including gramma duggar, 9 duggar daughters, Anna, Kendra, Michelle, Mackenzie, and Meredith. I'm going to laugh if both Jinger and Joy's first babies are boys. I'm really hoping one is a girl because I know there aren't many females in the Duggar Clan. Congrats to Joe and Kendra! And to Joy, Austin, Jinger and Jeremy as well! Does anyone know if there has ever been this many Duggars pregnant at the same time? For a brief time in 2015 Jill, Jessa and Anna were all pregnant. But jessa publicly announced after jill gave birth to Israel. Yes! Jill, Jessa, and Anna were all pregnant at the same time once. If Jessa announces a pregnancy before Joy has her baby, then there will be born than there ever have been. Jill, Jessa, and Anna have all been pregnant at the same time. Jill, Jessa, and Anna we’re all pregnant at the same time once. So I think it’s a tie between then and now with three at once. Anna, Jessa and Jill were all pregnant at the same time. When Jessa was in her first trimester with Spurgeon, Jill and Anna were also pregnant. Wasn't Anna and Michelle pregnant at the same time? I often wonder if Michelle and Jim Bob wanted one last baby. I had my oldest in 2009 and my youngest in 2011. I never found out what I was having. Told the ultra sound tehe to stay away from that area. Everyone in both families was so mad at me the entire pregnancy for not finding out. In a world where we can find out anything we want, I think the surprise of a babies gender is the best!! My father had a girl and a boy. His oldest sister had 2 girls. His youngest sister had 2 boys. I really hope Jinger and Joy have girls, Meredith needs someone to play with! At least Mackenzie has aunts around her age! Why couldn't Meredith play with her boy cousins? I'm hoping for that too. the funny thing is that grandchilren on for both that Bates and Duggars are going the same way as their children. Praying for a girl for Jinger and Jeremy. There are 2 granddaughters and 8 grandsons in my family. The girls are not in trouble. Everyone gets along fine and has fun together. You don't need an equal number of girls and boys. It's not a contest. i’m an 18 year old boy. my parents had 4 boys. i’m the eldest. haha. my aunt and uncle have 3 boys. and my other uncle and his wife have 4 boys. literally no girls. VHope that Joy Anna and Jinger have girls. My husband is one of seven. His older brother, him, then 5 sisters. Of those, 6 married & each had 1 girl & 1 boy!! Those have had 10 girls & 8 boys so far!!! I'm hoping Jinger and Joy have girls. My brother's wife is pregnant with their third boy. My sister has the only girl. I don't have any kids yet. I'm really hoping Joy and Jinger have girls. Mckenzie has aunts around her age but Meredith does not. Lets hope and pray girls! I'm 1 of 5 girls and we are all a year or less apart in age! No boys! The 2 oldest are only 11 months apart, so for 1 month of every year they are the same age! My 1 sister and I were born on the same day. My mom had her in another country and had me in the US. If I had been born in the other country like my sister, we wouldn't have the same birthdays because the other country is 1 day ahead of the USA. But, my dad was in the service and got stationed back here in the USA, so I've shared my birthday with sis my whole life and I've loved it! I was 6 months pregnant but I had to face different kinds of complicity . It was just because I did not prepare any kind of pregnancy planning. So I would like to recommend every women to have a planning for the pregnancy.